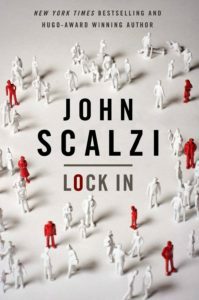 After reading The Collapsing Empire, I was in the mood to read more Scalzi, and luckily, I’ve had Lock In on my to-be-read list ever since it came out. Lock In is a near future novel set after a disease known as Haden’s syndrome left millions of people across the world “locked in” – unable to control their bodies but fully conscious. High-profile patients spurred the accelerated development of technology to allow these “Hadens” to participate in life again though neural implants, virtual reality, and robot bodies, among other things. It’s been a while since that all happened, and the government benefits that many Hadens relied on is about to be repealed, and it is an uncertain time. This is all just background for the story, though – the actual story begins when rookie FBI agent Chris Shane is assigned to investigate a murder where the prime suspect is an Integrator (a regular human who allows Hadens to rent their body.) It stays a pretty solid mystery/thriller type novel throughout, and usually I don’t care that much about that genre, but the worldbuilding and slowly unfolding plot kept me hooked. Scalzi takes the premise and runs with it, exploring how a disease like Haden’s would affect society in both big and small ways. I felt like I identified with the main character a little more than most people because I work remotely and haven’t met many of my coworkers in person. If you’d like to find out more about the world, Tor.com has a novella that explores the history of Haden’s here. I think this is one of Scalzi’s better books, even though the content was pretty different, it reminded me a lot of the thoughtfulness of Old Man’s War. I can’t wait to read the follow up, Head On.